Using WordPress for your websites is the ultimate choice for blogs, complex portals, enterprise websites and more as it powers about 24% of the web. With the increasing scope of Private Blog Networks, it is very important for you to know that WordPress suits your PBN best and can really be a supercharger for all your PBN sites. Easy – WordPress makes it really easy to store media, manage users (admin, editors and authors), manage comments and being available in over 70 languages makes it a perfect content management system for any kind of website. You just need to have content and you can start publishing by creating a post or page in a minute. Many Themes & Plugins – WordPress has a lot of customization options which makes it a really flexible system for operating websites on. There is a whole directory consisting of thousands of themes to choose from depending upon your requirements. If you have bought a theme or developed a custom one, you can even upload it. It also has a plugins directory which has infinite plugins developed to support social networking, spam protection, forums, galleries and lot more on your website. Community Support – Being the most popular open source CMS on the web, it has a very enthusiastic and supportive community. The support forums are very active, regular WordCamps are organized in many cities to share the knowledge and the tutorials on the blogs are very helpful. Now that we know the benefits and how useful WP can be if you choose to install it on your website, let’s have a look at the options on how to install WordPress on your PBN site. It’s pretty easy to do it. You have used WordPress earlier to install it on one of your main websites. But we will discuss two of the most common methods which you can follow to install WordPress on your new PBN website. Manual Installation of WordPress – The manual installation implies several steps which we have listed down below. It is not mandatory to install WordPress manually but if you face any difficulties using the tools, you can use this method as well. Enter the details and finally click on Install WordPress! Installing WordPress using Softaculous – This is probably the simplest way to install WordPress on your websites and it’s a recommended method by a lot of people as it involves only a few clicks on the buttons and your website will be running smooth as butter with WordPress installed. Note: If you do not see your website load after installing your WordPress site, you may need to point the nameservers, wait for propagation, or another DNS or Domain related issue. Is it convenient to Install WordPress on all PBN websites? Yes, it works! WordPress can be very effective for your PBN websites with the multiple flexible features like unlimited themes that can beautify your site plus thousands of plugins to choose from which can make sure that the website is SEO optimised, socially sound and a lot of other functionalities are available which makes WordPress the best and the most simplest option to put your site on. Fact: Around 70% of the total website on the Internet run on WordPress! How to find a good WordPress Theme ? Free WordPress Official Theme Directory – The free WordPress directory of themes has around 4k-5k themes with different layouts like the responsive, commercial and blog based. There are filters which you can select from that allow you to choose the colours, layouts (fluid, fixed, 2-column, 3-column, 4-column, left sidebar, right sidebar and more), features and subject of your website. This makes it really easy for you to find the most suitable theme for your website. Best Websites to buy Themes – If you can’t find a good theme on the free directory, you can always use buy the premium themes. There are a lot of websites that sell premium WordPress themes that suit websites in domains like Responsive, Blog, eCommerce, Portfolio, News and forums as well. These themes may cost you some bucks but are really worth buying and using it on your websites. All the premium themes have a great minimalistic, drag and drop functionality and superb responsive design which make them very useful and flexible for use. If you are an individual looking for a beautiful theme or a company looking for a very classy theme with a lot of functionalities, it is recommended to buy a premium theme as it can offer you many features along with the ease of use. There are several settings in WordPress which you should take care of right after WP installation on your website. We have curated a list of some basic settings which you should ensure are right on so that your website becomes search-engine friendly as well as all the content on the website stays organised. Permalink – The default WordPress permalink is like http://yourdomain.com/p=223. Though this permalink is short, it is not really search friendly. Go to settings -> Permalink and select the post name and click on save. This makes sure that your permalink when appearing in the search engine will contain some keywords, and your blog posts will rank better in the different search engines. Categories – Usually the most important part of the website is the navigation bar/header which contains the menu or the list of categories with sub-categories and so on. For example, if your website revolves around technology niche then the menus will contain Windows, Gadgets, News etc with sub-categories like Mobiles, Tablets etc. This helps you to keep all your content organised and will make user navigation easier. Install the necessary Plugins – This will certainly help a lot in terms of site speed, keeping the content organised as well as increase the social reach and search visibility of the website. Go to settings -> General and set your blog name, tagline, blog description and time zone which will help you to keep all the data about the website in order. Fill out your Website – It is recommended to fill out your website with as much content and rich media as possible. You can add social widgets and resource pages in the sidebar to make the site look more beautiful and real which is a very important factor for passing the manual reviews by Google. To make sure that your site runs well and is best suitable for the user and the search engines, it requires some plugins which you need to install and below is the list of the most vital WordPress plugins which you should consider installing on your PBN site. These are the 5 top WordPress plugins which you must consider installing on your PBN site for the best performance and visibility and to make your website search-engine friendly. The most important aspect of a PBN website is the capability of passing a manual review by Google. You should aim to make your website look as beautiful and diverse as possible. The key to create a successful website is to build and nurture it regularly with content like a real website and not just use it for the purpose of getting links. We hope that this article will help you to supercharge your PBN blog setup on WordPress. The above discussed strategies and methods are best suited for a website and will help you in the most simple and effective way to setup a perfect PBN website for your network. If you have any kind of queries or doubts regarding the installation, basic settings or plugins on WordPress platform, feel free to drop in your comments below, we would love to help you out and clear the obstructions coming your way. When you own a website online, the worst part is the fear of it getting hacked by someone. 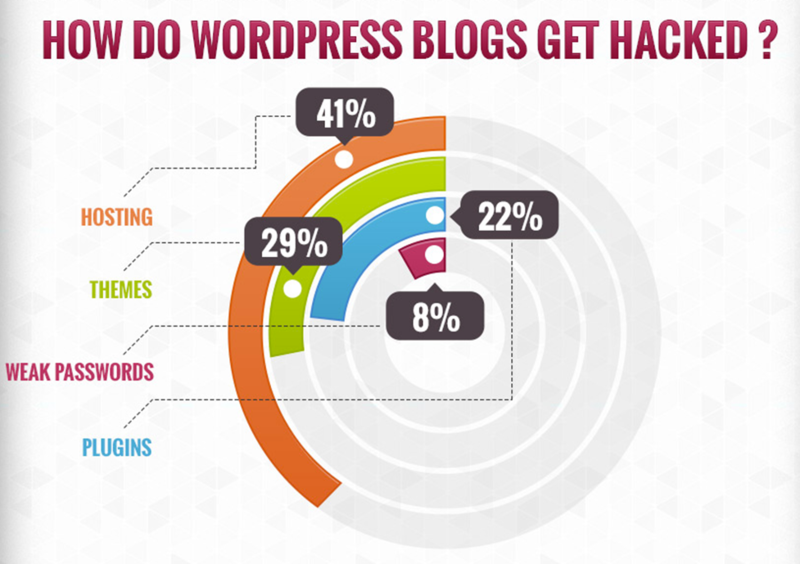 WordPress websites are actually vulnerable to security attacks and are hacked a lot in the recent times. You might want to be curious to find out what exactly can make your sites loved by hackers if you own a huge PBN network and want them to be safe. A hacked website can be really bad for your business as well as for your readers today since a lot of people rely only on the online data. It is really important to make sure that your site isn’t hacked if your website contains a lot of data, some of which may be confidential as well. If the hackers can get access to a large user base it might be possible that they may harass them in some way or the other. So if you own a business website, a blog or a PBN for your client or your websites, it is advisable to have a secure circumference around all your websites to keep them safe. Google had taken a serious action on all the .co & .cc hosts which were known as the free hosts and de-indexed almost all websites running on them. The main reason for this was because of a lot of spammy or low-quality sites were running on both of these hosts. Matt Cutts stated about this in a post on Google+ as well. There may be several reasons why and more importantly how your PBN site may get hacked when you are on WordPress. In this section, we will discuss some of the common reasons regarding which you can take precautions in order to keep your PBN sites secure from the hacker attacks. Most of the experienced hackers know that the default username of WordPress website is admin when it is installed for the first time. It is very easy for them in order to crack further as it is quite obvious that the password would be predictable as well. This could be a huge threat for your PBN security if you do not take it into consideration though it might seem a very minute issue to you. There a lot of sources on the Internet from where you can download themes, plugins and free scripts which you seek because you don’t have enough funds to buy the premium ones. But you need to be careful here as they might be infected or contain malicious files which could hurt your site. As we talked about .co & .cc at the start of the article and how Google slammed all the websites which were running on these hosts. Avoid hosting your PBN sites on those hosts who do not monitor their servers and don’t update/patch system on a regular basis. You can even diagnose your website for checking the hacked status by checking the Google Webmasters account for any messages regarding the malicious behavior of the website. The visitors can usually see an image similar to the below one when a site is attacked by a hacker. There are several measures and tweaks which can implement in order to keep their WordPress site and improve their PBN security. Some of the best and easiest ways are listed below so make sure you go through each of them. Security breaches can be avoided easily by following the below methods, so let’s have a look at them now. Always update the themes and plugins used on your website to the latest version. Take regular backups of your databases and files on the site, store them somewhere else and not on the same server. Regularly scan your WordPress website using some plugins like WordFence, Bullet Proof Security plugin or Better WP security plugin. Use premium plugins which can take full backups of all your data and sends them to your preferred storage location. Taking precautions and always keeping a check on your website can save you from all these headaches of being hacked or reviving your website from a hacker attack. It’s quite easy to follow the above-mentioned tweaks which you can easily implement and keep your PBN secure in the long run. Websites are basically your identity in the online world and making sure they aren’t defamed by some playful people is very important. We covered some important aspects in this PBN security guide and hope that you all will be able to secure your PBN sites using the methods shared. Feel free to comment below and fire your queries so that we can get you covered and solve all your doubts. Let us know if you have any good solutions which we missed out here. Keep reading, cheers! Finding a good writer who can help you get done with a superb article in budget is a headache which most of the website owners have today. Getting high-quality articles written for an affordable price is one the pillars of my online success. Having a website with powerful content can make Matt Cutts favor your website in the Google SERP’s without any excuses. In this article, I will share some of my measures and secrets which I use to analyze a writer and how he himself agrees to write a good HQ article for a cheap price. What can you do to lower the price of the article? Before hiring a writer and dealing with the price, make sure you follow the below steps which can really help you to lower the article price which you will be buying. Explain in detail: Try noting down what exactly you need from the writer who will be completing the article. The mindset of a write is that he will have to do extensive research about the particular topic which will consume a lot of his time and hence he charges you more. What I usually do is that I prepare a quick, straightforward and small outline for each article and hand it over to my writer. Now, since he knows what exactly needs to be done, the price would be much lower comparable. Time: Time becomes a very vital aspect when it comes to article writing. The writer may charge you high if time is a constraint so try giving a good amount of time to your writer to complete it. Stick to one writer: This might be a very good tip for you if you are looking to find a good high quality as well as affordable writer. It’s advisable to keep one writer happy who caters your needs and build a long-term relationship with him. How you can get a Good Article for just $1? My recipe is quite simple and unique which can help you all to get a good quality article in $1 only. These ideas have never been shared on the Internet and today I am sharing this with you because I know the pain to find a good writer who suits best for my budget. Article writing is done best when it is not completed just for the sake of writing. A writer who understands what exactly the readers wants to know is a successful writer. Below are the steps which you can follow to get an article as cheap as $1. There may be different choices like hiring Filipino writers or using TextBroker where a 4-star writer charges $20 for 500 words. I ended up in getting low-quality content from the first option and the second one seems quite expensive since I have about 50+ articles and it seems a risky investment. I agree that finding a good article writer can be a tough task as even I, have come across dozens of writers but found out that only 1 or 2 are really good and worth the buck I am paying. Also, if you can’t realize that the writer you are using is producing good or bad quality article then it might be a waste of your hard-earned money. It would not be hard if you keep in mind the detailed points that I have discussed in this post. Why? Because I have followed the same elements and have found some irreplaceable writers who provide me exactly what I need. If you ask me which is the best methods out of the 3, I would say direct communication while talking to people on relevant Facebook groups has proven to be the most effective one and I would also recommend that to you all and hope you find out the writer who is made for you. Today I am going to introduce you to a little trick on how to increase your revenue. For those who have online websites, you may already have your main web page for selling shoes, water pumps, pet stuff, etc. Then you could do SEO by building your own private blog network. Suppose you build your network of 100 IPs (100 domains or websites), that means you own 101 websites (100 + 1 main web page). Have you ever noticed that you have online competitors selling the same thing as you do; these websites spread all over the Internet. As you may or may not know, these web pages belong to the same owner. Suppose that you sell a brand of shoes that your competitors also sell. They have 10 web pages. That means you virtually are selling against 10 other competitors in the online market. Simply said, you have 101 websites, why don’t you make it your small virtual online shops? Then you will now own 101 online shops and that will also save you from having to rent space from brick and mortar shopping mall. The method is not very complicated. You only need to do websites and review your products. You tell people how good your products are, demonstrate to your customers how your products are used, and then leave your contact information. Now this technique will certainly increase your sales channels and your sales revenues. But you should be careful for the following. If you ever come across my previous posts about private blog network, you may already knew that you should not leave any footprints or any information that are duplicated in all of your web pages. Google can detect these footprints and finds out that they belong to the same owner. By putting the same contact information, phone number, the shop name, you will leave the same footprints for Google. Of course, I will not recommend you to put lots of phone numbers as you would have 100 different numbers and that is not possible. What I suggest for you to do is very simple. You will turn your contact information into images. Design different styles of your image for contact information. Google cannot detect image information just yet. So it should be safe to use this method. One important thing is to change your file names for different images to further conceal your identity. This is a very common issue found when building private blog networks. How to put backlinks on private blog networks to get the best result? Today I want to tell you ways of placing links and their pros and cons, so you can decide where you will put your links. Links 1 and 2 is a site-wide link because they are setup once and will be shown on every page of your websites. Even though the number of exposure is high, the risk is that Google may consider them as spam links. As you set it up once and the links are shown on all of your 100 pages, there will be 100 backlinks for one page. If your web is not really popular, this way of placing links will have a bad effect for your website. You should be careful about putting backlinks in your private blog network. Do not put the same set of links into every of your pbn. Think about it, you make such perfect websites. You put different materials, different themes into your blog network. But your links are the same on your sidebar or footer sections. That is an obvious footprint. The links number 3 are links that are placed within the article. It is recommended and popular way to put these links as they have more power than any other links on your web pages. However, you should be careful if you put links on your web posts. If you put links using only keyword anchor, it is possible that Google can detect your private blog network. Thus deindex them. (Actually, Google uses density of keyword anchor as one parameter to determine web spam). So my recommendation is to mix all of the 3 types of links as following. Use keyword as link anchor. Use sentences as link anchor. Use URL or brand or website name as link anchor. What about the position and the number of links per post? It depends. In general, you should not put more than 3 links per article. You should not link to the same web page. For links position, you should place it within the blog post or you may make it as references just like Wikipedia does. I am back as promised. Last time I didn’t tell you about types of posts that Google loves. This issue is very important in having a say about 70% in making successful private blog network without getting deindexed. Before starting, I want to tell the opposite side which is what kind of posts that Google doesn’t like. You definitely don’t do it. Otherwise what you have done will be a waste. It will gun down your web site’s ranking. Waste of time and money. Scrape content – Those posts that scrape contents from other websites and insert keywords. This technique used to work very well in the past 3-4 years ago. It is simple and easy to do for people who can code scripts. The scripts will just extract news and contents then add a number of keywords and backlinks. Then they spin the post and make it look different and put it on different websites. These posts are usually crap and very low quality of content. And most importantly, the contents are not related to the keywords inserted. For example, the contents are about politics news, but the keywords are about selling clothes. This is weird, don’t you think. Now Google can detect this kind of posts even if they are posted in non-English language. Very short content – Someone writes their own posts but write it very short about 1 paragraph or less than 500 words. These short posts will not help for ranking, just waste of time. Too much exact keyword anchor in the post – Those posts that include links by using keyword anchor for every link. The links have the same pattern. Generally, if we use a script to automatically post articles, they will likely forget this point. They do not adjust so the posts look differently on link pattern. The post looks good, self-written, at least 500 words, but the link keywords have the same pattern, the same place on every post. Anything that has a pattern, It’s footprint and Google will detect and deindex your pbn. Think about it carefully, you invest a lot of money on your expired domain, hosting, but you are stuck with lousy SEO. You are too lazy to write your own quality content (Or hire someone who good at it). You are killing yourself. You are wasting your money doing a private blog network. Now you know what types of post are bad. I will explain what types of post are counted in quality content. If you remember my previous post How to make your pbn look likes real website, you should think further what we should do to make it look like real websites. I simply think this way. Normally, people who write blogs write about things they know best. They will put their own style or their personality into their posts. This is called ‘personas.’ Simply put, when we talk about particular blogs or personalities for example yoast.com, nice cartoon pictures with an author description in the post footer. You may complain at this point. What a waste of time to build ‘personas!’ I would have to tell you my simple way of building personas. I use various author plugins and that will make the author part in the footer of post nicely. It will show information on the authors of the posts. You only do it once. Write about the person, who he/she is, what his/her lifestyle, why writing this blog, for example. We can build personas for several authors in one blog. After we build a personality of the author for our blog, we will write articles. I suggest that you write your own article. However, I know that it will be a big task for you to write lots of articles, you may hire some freelance writer to do it at low cost. I will talk about how to hire freelance writer later. Of course, the length of articles should be longer than 500 words. a 1000-word article is called long-formed. Long-formed article – This type of articles is very popular. Long articles with good contents together with pictures or video clips are what we are looking for. This type of article takes lots of time to prepare but it especially fits for content marketing. We do not expect only results of SEO but when people read these articles, they get something back and will want to buy our product. How-to article – This type of article is very popular. Try Googling on how to write how-to articles. Search for several how-to articles and mix them using our own style of language. It is as easy as that. Ranking or collecting article – for example, top ten house plans, top seven buffets in town, 5 ways to ranking in Google. Someone expect Google bot to visit their website frequently by update content too much. In fact, posting articles too frequent may have a reverse effect if all articles doesn’t have a quality threshold. Google uses bot to crawl webpages and they make it very quick to do index of webpages nowadays. In my own opinion, I post only quality articles and I don’t care about the number of articles. I usually post one article for one targeted keyword. What type of links is best? I believe that I wrote about this topic before. Today, you should avoid setting private blog network using keywords as anchor text in every of your articles. It is a risk as Google has algorithm that can detect it. You will possibly get deindexed using lots of keywords as anchors. For me, I will mix among three types which are keyword, sentence and website name or URL of that web site. Today’s article is a bit long because this is a long-formed article. Ha ha. Hope you will get something from it. If you have any question, please write a comment to me. Thank you very much. Today I talk to the famous SEO professionals who work with large SEO company. He said private blog network is still the key success for ranking. He use private blog network in improving ranking for his customers’ websites as it yields good and effective results. We discuss if we ever get de-indexed. I get a know-how update from this specialist in setting up private blog network. Many things he said confirm my internal research. I want to share what I know with everybody here today. The name of the blog’s author should be different – when we setup WordPress, we can indicate the admin’s name. Here we should use different names for each blog. Use different themes on each website – today, it is super easy. There are thousands of WordPress theme for you to choose from and they are free!!! Apply for social network account for each blog – quality web page that is carefully setup always has facebook, twitter to encourage viewer’s engagement. If we are diligent enough (only one-time setup), we should apply one account for each blog. Now our blog network will look more professional. Or when you register for domain name, you should look for domain that already has facebook/twitter account. It will be much better as you will have those facebook/twitter accounts with followers. Add privacy/contact/term of use page – these pages will appear on every big website. When we setup our private blog network, we can set these up altogether. The techniques are mixing various names; don’t use the same name on every blog. For example, use ‘contact us’, ‘get in touch’, ‘contact’, or ‘send email’. Permalink setting – WordPress has a link system that is called ‘permalink’ that allows us to configure the link formats on our web page. Go to setting > permalink. Don’t set it using the same format on every blog. General information on website – it is very important that you setup general information of web page, slogan such that they make your web pages look really really beautiful. Make them as various as possible on each of your blogs. You may follow your web page name, for example we may use the blog title as ‘Fast mover get rich – the fastest way to get rich’ for domain name ‘fastmovergetrich.com’. Someone set up private blog network by hiring someone to design different logos for each blog. They put an investment on their blog network. If we are on low budget, we can easily design our own logos. Don’t have to be fancy logos just not the same logo in each blog. In addition to the 6 techniques I share today, there are some other good techniques that I didn’t mention. But what you should remember is how good web sites look like. You should setup yours that way. Make it look real. You should make your web sites look real. There is another important issue that can be the most important one is the articles themselves. Next time, I will explain to you what type of articles that a good private blog network should have. Today I will introduce some WordPress plugins that is recommended for private blog network. I will also explain how good they are. Let’s start! Mainwp – This plugin help overall managing of all of our wordpress blog. Whether it be version update, plugin setup, theme setup, change setting. Mainwp has main concept as allowing us to setup various plugins on each of our websites. Then we can login into central admin page of Mainwp and manage all of our wordpress web pages at one point. WordPress SEO – This plugin can be used in place of ‘all in one SEO’. It is a very popular plugin because it helps on generating meta title and description on our web sites automatically. Author sure – Have you ever seen Google search results that show author’s pictures as a small avatar? The pictures are taken from their profiles such as Google+. This plugin helps link our google+ account and show on the search results. The benefits are that it makes our websites looks like real website, not spamming websites. But we should always use different author’s name for different websites. XML sitemap & Google new feeds – This is a plugin that will generate sitemap file for us automatically. The sitemap file is like a map for google bot to come get information on our website easily. Allowing Google to index our web site more quickly. Table of Content plus – ever seen that some big web site with long contents like Wikipedia has contents on top. This plugin will help to create a table of contents for our posts which make our articles look good in the eyes of Google bot. Contact form 7 – This plugin helps build contact form. Why do we need a contact form? It is just a private blog network. Who is going to contact us? Don’t you think? But I want to let you know that in making private blog network, we need to do everything just like real websites. And real websites have contact form (even though no one will contact.) Just make our websites real ones. Akismet – This plugin originally comes with WordPress. It helps you manage spam comments perfectly. I hope that this article is useful as I had many people asking about this topic. When I am more available, I will come and update more. Should we use wordpress for all of our pbn? Hello. It’s been a month since I started this blog. I have continued writing blogs about how to setup private blog networks. The blogs are about how to register for servers, domain name, find hosting. At this point, we come to how to setup websites. I have a lot of questions on this issue. What cms should I use for setting up website? Should I use wordpress for all of my websites? I will answer these questions today. Why do 90% of private networks use WordPress? Because WordPress is easy to use and setup. It is a content management system that people around the world like to use. And it is FREE!!! There are many plugins and themes for you to choose from. Changing WordPress themes is a matter of a few clicks. There are a variety of automated script for managing wordpress via XMLRPC. 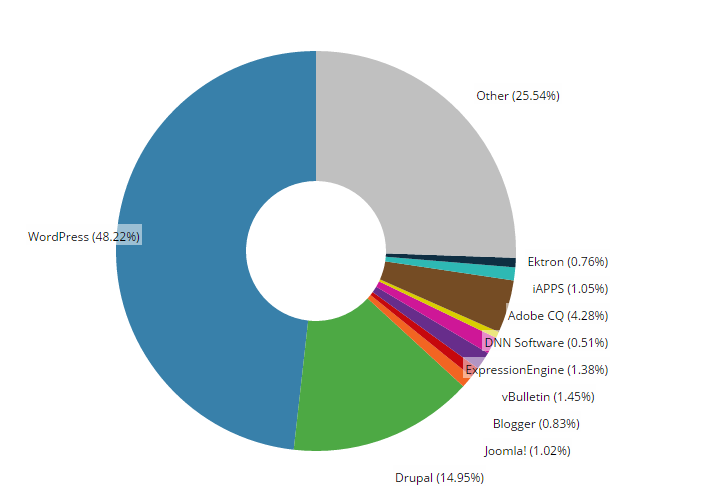 So it is not unusual that WordPress is most popular among websites. But the question is, ‘is it safe for our private blog network hosted with WordPress for all of our websites?” Let’s look at the following statistics from the worldwide usage of CMS shown in the graph below. WordPress usages are almost half of all websites worldwide. Seeing this graph, I will have to say it is safe to use WordPress to setup all of your websites for the reason that most people use it. And it is not reasonable that Google will ban websites by using wordpress, don’t you think? In fact, Google policy for banning websites is purely on the websites characteristic itself, not about CMS you are using. As long as Google detects that your website is a spam, whatever CMS you use, you will always get banned. If I don’t use WordPress, what is your recommendation? You may use less popular CMSs such as Drupal or Joomla. You may write your own webs using Html. If you know Html syntax, I recommend it. It is the safest method as you will have different structures for each of your web pages.